maybe i've mentioned this before, but andrew and i LOVE our home. since buying our little cottage in october of 2012, we've made a lot of progress in making it our cozy getaway in the city. if you've been following for a little while or if you know me [in real life] you know that i love a good deal. it's a constant battle: wanting our home to be picture perfect and not wanting to break the bank. decorating a home on a budget takes time. finding good quality pieces that look way more than their price tag takes time too. i've compiled a short list of recent [and future] budget buys for the home that i love and hope you will too! curtains | if you visit our home, it’s no secret that we love ikea. what i love even more is that they have some traditional décor options that are very wallet-friendly! we have 2 sets of the lenda curtains [white and beige], and i love them both! the longer length is perfect for a high curtain rod and gives a sophisticated and finished look to any room. pouf | in the past 2 months, i've been working fervently on the 3rd bedroom & office. the black/white/gold color scheme is a little more modern than the rest of our home, but we [andrew included!] love it! for christmas, i included this morroccan pouf form on my wish list and, what do you know?, santa [my lovely in-laws] came through! for $38, you can buy the pouf online and the filler for an additional $15 at your local sewing shop… or if you’re me: use old towels/throw pillows, because i'm lazy like that. as much as i love a designer pouf, i'll take the $200+ discount! mirrors | mixing contemporary with traditional is one of my favorite ways to keep our home’s style up-to-date. 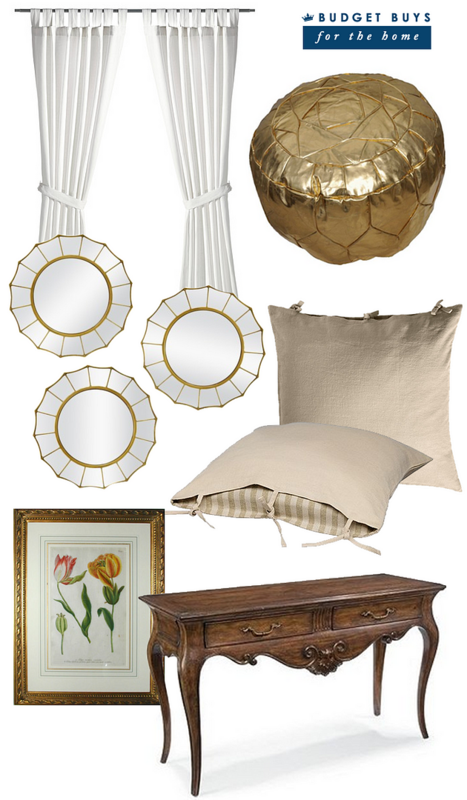 the gold sunburst mirrors at target would look great over a bed [horizontally] or in an entryway or hallway [vertically]. this may just be my next budget buy! pillows | again, with the ikea purchases. i LOVE pillow covers. my taste has changed a lot in the past years, and i have a surplus of throw pillows that i don't love so much. these pillow covers are great [and budget friendly] because they’re durable, washable, and inexpensive. ikea for the win! prints & furniture | never underestimate the value of craigslist, estate sales, and hand-me-downs. our house is full of furniture that, at one time, was left unwanted. usually all it needs is a coat of paint and a little love! several items were handmade and back to being as good as new – plus i love that these pieces add even more character in our little 1940’s home! WHAT’S YOUR FAVORITE BUDGET BUY? I have to say, charlotte Craig's list is a huge step up from the CL in RI. I' found an amazing $20 coffee table! I just went to the Ikea store for the first time last week and was AMAZED!! I'd perused online and heard good things, but actually going to the store was so cool!